Frank Bruno is a respected and well-loved English boxer. He is a world champion who retired with a record of 40 wins and five losses. Bruno became WBC Champion in 1995 after defeating Oliver McCall. He is also well known for bouts against Mike Tyson, losing both those bouts. Frank Bruno retired in 1996 and began to spend his cash quite erratically, a classic symptom of bipolar. His life became more difficult after his marriage dissolved with Laura in 2001 and his trainer committed suicide. In 2003 Frank was sectioned under the mental health act in England. Being “sectioned” means being forcibly taken into psychiatric care. It was in this admission that a diagnosis of bipolar was made. Bruno attributes pride and not wanting to acknowledge fault as preventative reasons for him not seeking help earlier. It was there he began to understand the nature of his bipolar condition and his tendencies to experience odd behaviour and mania. Bruno latter attributed cocaine use to further problems with mental health. Early in 2012 Bruno checked himself again into the facility as he was suffering the effects of emotional exhaustion. The fact he did this voluntarily demonstrates further insight and a recognition of the condition on his part. In a show with Piers Morgan, Frank Bruno revealed how his condition has resulted in him being sectioned multiple times and spoke of a knife attack within a secure hospital. It’s not uncommon for sportsmen and women to struggle after retirement. When public spotlight and adoration is quickly withdrawn it can expose emptiness, disillusionment with life and feeling unwanted and lost. There are many high profile cases that spotlight the trials and tribulations ex-sports stars can face. Collision and high impact sports are also notorious for causing head injuries leading to conditions such as dementia. Often these sportsmen grow up in cultures where showing weakness and vulnerability was a big no-no, so when times get tough, the tendency can be to grit your teeth and try and push through the pain. This approach when dealing with a serious condition like bipolar just doesn’t work. It’s not about self-will. 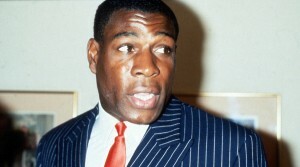 We affirm and commend Frank Bruno for being open as he builds a life after severe depression. For Bruno, beating his bipolar is an ongoing battle. He is now playing an active part in destigmatising mental health and is a tremendous light to the community. Frank’s fighting heart continues to beat and inspire.